Follow along at AtelierDuBricoleur and build your own wide sliding featherboard. 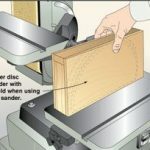 When I use the belt on my belt/disc sander, it makes me a bit nervous to have the disc spinning there while my attention is focused elsewhere. So I devised this sanding disc shield to help. Tips on how to router small pieces safely. My table-mounted router seemed ideal for shaping 3/4 inch stock into knobs for a box I was building, but the small blanks–only 1 1/2 inch square–would make the job hazardous to my hands. So I built this router jig, shown here, to hold onto the blanks. Free Workshop Plans to Build a Trash Can Dust Collection System. What I did was replace the loose cloth bag with the sturdier and more convenient combination of a garbage bag inside of a rigid plastic trash can. Thereby reducing the messy job when using the cloth bags. Switching between a standard blade and a dado blade on the table saw also means switching the throat insert. On top of that, different size dado blades require matching zero-clearance inserts. So rather than keep a stack of inserts on hand, I came up with a shop-made, one-size-fits-all insert.